Harley Davidson Forty Eight prices start at Rs. 10.58 lakh (Ex-Showroom). 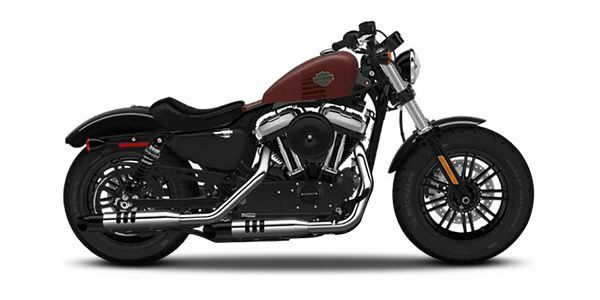 Harley Davidson Forty Eight is available in 1 variants and 6 colours. Share your experiences with Forty Eight? The claimed ARAI mileage for the Harley Davidson Forty Eight petrol is 16 kmpl. The nightster is unlike your normal Harley which swims in a pond of chrome. The nighster is all about stealth with matte-finish a no polished surface. Q. Does it have white led light? Harley Davidson Forty Eight Forty Eight gets Halogen headlamps. The Forty Eight has the classic 1948 style small peanut tank, wire wheels, forward-controls, a wider front tire with a fat front end and chopped front fender, a slammed speedo with under mount mirrors, low solo single seat, and low suspension.